Goodness gracious this is going to be long, so let’s go! Set your time you’re going to do it. There will never be a perfect time with nothing going on, you’ve just got to block it off the calendar and GO! We chose to do it in the spring when my husband could give me 2 full days when he had some time off for spring break. Then, you’ve got to set up shop. Cover any surfaces you don’t want to get paint on. Most of our work was done in the garage, and we used the kitchen counter as well. First up: remove all doors and hardware and let your handy, super strong assistant separate them into bags. Number all doors and drawers with numbers and leave a number back where you got them from so there is no confusion and they will hang correctly when you re-attach them. while we were painting, we kept the number right above the door. It got hit with the sprayer, but you can still see the number, right? We spray painted our hinges with brushed nickel spray paint, so my boys put the screws in a piece of styrofoam to get them ready for spray paint. If you have lots of build-up on your cabinets you may have to clean first with a degreaser. The Zinsser primer we used said specifically to avoid TSP cleaner, so we skipped that and just used Fantastik spray degreaser. Sand all the doors and drawers with an electric palm sander. If you don’t have one, it is well worth the $30 investment!! Fill in any big scrapes or holes with wood filler, let it dry then sand them down nice and smooth. Then the real fun begins. We had a paint sprayer we used to stain our fence, so we used it to apply the primer. We did a trial run on my daughter’s furniture~you can read more about that here. We used Zinsser’s oil based primer, and since it’s fairly thin, it worked in the sprayer like a dream mixed with some Penetrol. We didn’t use the sprayer for the paint though because it was too thick. If you don’t have a sprayer, the small foam rollers and a quality brush (you can’t go wrong with Wooster or Purdy brand! )will work just fine. Apply 2 coats of primer, then sand lightly with a super fine sanding block to get them super smooth and ready for paint. and then wipe them down to get all of the dust off. Let dry. Then, the real painting begins! First, I have to tell you a little back story on the paint. When we did our trial run in my daughter’s room, we used Benjamin Moore Impervo paint in white dove. I had done my research online as far as what people had used and been happy with and BM Impervo paint came highly recommended. The only problem is that it takes forever to dry(okay, when I say forever, for us it was 24 hours per coat and I’m not patient) We were on our second day, my husband had some deadlines and we were going to go out of town for the second half of spring break, so we decided to go with something that was quicker drying since we wanted to do 2 coats and be done with it. I was sick of trying to keep the kids out of the kitchen. And it dried much faster and we finished the painting for the most part that second day. Let me say that this is not bad paint. But the areas we used the Impervo paint on, including my daughter’s furniture, is rock hard and I love the satin enamel finish the impervo settles into after a few weeks. I try to scratch it with my nail and it’s really, really hard to do. I don’t have to work too hard to scratch the Lowes paint. Looking back, I wish I would have been patient and just gone with the Impervo as much of a pain it would have been for it to dry. My advice would be to go into a PAINT store like Sherwin Williams or Benjamin Moore (not a big box store) and tell them that you are painting your kitchen cabinets and see what they recommend. I give the Impervo two thumbs up, once it’s dried and cured. John & Sherry at Young House Love are using BM’s Advance Paint and seem to love that, so check them both out. And that is Melissa’s take on things…back to the painting process. It works best if you can have one (or more) painting bases on the inside, while the doors and drawers are being painted in the garage. When we painted the drawers with the small foam rollers and a quality paint brush, we let them hang slightly over the counter edge and that worked well. Also a tip: even though your drawers will seem dry, they may stick when you put them back in and they sit against the cabinet bases for awhile. Apply a thin coat of vaseline where the drawer meets the base to prevent sticking and ripping off the paint. You can wipe it off after a week or so when everyone is complaining that ewwww, the inside edges of the drawers are sliiiimy! 1. Prepare to set up shop~you’ll need lots of room to work. Protect areas you don’t want to get splattered with paint. Read a bunch of tutorials online to see what worked for them, then decide what’s best for you. 2. Remove cabinets, hardware, spray paint hinges. Number them so you can put them back in the right spot. 3. Sand everything down including bases, then wipe them down. 4. Use two coats of Zinsser oil based primer on all visible wood surfaces (we didn’t paint the inside of the cabinets, except for one where the glass doors were installed), letting them dry in between coats. Lightly sand and remove dust. 5. Use two coats of Benjmain Moore Impervo (color: white dove) letting them dry between coats. If you have any questions, ask in the comments! There have been some great questions, and I’ll follow up with one more follow up post to answer them all in one spot. I have no affiliation with any of these products or brands~this is just our experience. Thanks for sticking with me~happy Tuesday! This is my Spring project and this was a HUGE help! The paint is too thick for the spayer? That scares me. I hate rolling :) could they have added an additive? Just wanted to say thank you for all the wonderfully useful information on painting cabinets. I just painted mine using the identical products and process I learned through your detailed post. I love my new kitchen, just waiting for new counters, backsplash and appliances. Hi Kelly~too much work! lol No, of course you could use it, just make sure to get a brand that doesn't yellow. Totally worth it! Beautiful job. Thanks for the paint tips. Would you recommend Rustoleum Kitchen Cabinet Kit? 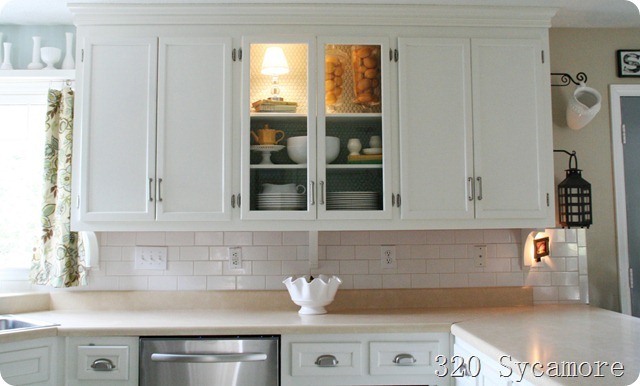 Do you suggest all cabinetry in your house to be the same color? Great job! I have been contemplating painting my oak cupboards. How much did this project cost you to do? I am about to do this but what I am wondering is can you see the texture of the wood grain thru the paint? Could you when you painted your daughter's room? There are several products on market called Wood Grain Filler (not wood filler)---Wood GRAIN filler.BM makes one as does SW.They are a little pricey so artist gesso works just as good, easier to handle and cheaper. Apply it in a north/south direction and then go east/west to remove excess. Let dry and sand to glass smoothness. Did entire kitchen of oak cabinets with this method...they turned out perfect! Absolutely no grain shows thru. Hi. Great post! Thank you. We do a lot of high gloss painting on our cabinet doors. They look brand new Melissa. Great job. I found your blog through Centsational Girl. What a great idea about the screws and hinges. I am going to be painting my family room builtin cabinets. I had already purchased brushed nickle knobs, but had not figured out what to do with the hinges. I am going to do the styrofoam and spray paint. Great tip. I am also going with your paint recommendation. It looks SO good and I can't believe you did all that with kids! I have a weird question about caulk. I need to caulk my baseboards but I only have clear caulk (it's paint-able & sand-able) do you think clear would be okay? Just wondering. Great job on the kitchen, thanks for sharing! I think I will try on the drawers and doors so I will let you know someday if they do yellow! What are your thoughts on poly acrylic? I painted my cabinets and had chipping on just one door, so after fixing it...I was thinking of trying it? I have used it on furniture with success, but brush marks are a worry with something so high profile. Way to go sista! Everything looks awesome and I have to say you have the cutest little assistants ever! Miss them. I used the Impervo in my kichen. It has held up really well and I love the finish too. However, it did yellow a bit after 6 years, but only enough to notice if I am touching up a chip (which are only on a few corners). I would use it again. I hope to tackle this job next month! I have a question that perhaps you can answer. My cabinets are not painted or stained but instead are covered in some sort of hard finish that after fifteen years, it simply pealing off (photo attached.) Behind the finish is plain particle board. Do you have any thoughts on how to prep these for paint? I have painted two vanities with similar finish and just pealed off the finish, cleaned the cabinetry and painted. Not sure how it will last in the long term over a more throughout prep process like you did. LOVE it!! You can say, "hey, brainless..."
Love this!! Your kitchen looks amazing! My husband and I have started the project of painting all the trim in our house and next is the kitchen, Love that you used a sprayer. We have been deciding if we want to use this way or buy the kit from our local home depot which is a three step process my concern is the paint chipping. Thanks for posting this it's so nice to see it done!! Love! the "new" kitchen. Congrats on a job well done! I painted my cabinets about 2 years ago, but the paint is chipping off in some places and I'm contemplating painting again-correctly this time. Do you know, or anyone else reading, do I need to sand off the paint back down to wood? What are the steps I should take to repaint? Thank you Melissa, this tutorial is going to come in handy to refer to. Your kitchen looks phenomenal! Love all the hard work you guys put into it, so worth it right? SO good to know...that's the only complaint I've heard about the Impervo so far. Thank you! One sort of garage storage you may consider are pre built cabinets and shelving. These are usually made of wood or resin and can be found in just about any box store. SO we have the old flat boring oak colored cabinets and I have been wanting to change them. I would like to put molding on them to give them dimensions before I paint. Anyone ever tackle thos? Any hints or suggestions to make it easier. Thanks in advance...love your work! Ok I will never ever complain about my already white cabinets again after seeing how much work went into you achieving them! They look so beautiful and I feel just a little guilty that I have grumbled about my white cabinets when I didn't have to do anything but sign the papers when we bought the house! You are so talented, I hope you know that and a huge inspiration. Great job!!! Did you prime the screws and hinges before spraypainting them? Can you explain that magic you did with the chalk there? It looks like it made a big difference! Did I miss the finished picture somewhere? I just happened on this post and didn't notice a before/after shot...hopefully it looks awesome with all your hardware back on! Whew! Thanks! I've been waiting for this post so I can get busy on painting my kitchen cabinets too! Thank you, thank you, thank you!!! The folks before us painted the cabinets and didn't take this time and care. Thank you, thank you, thank you! I don't think this was asked before but did you chalk on the front panel of the cabinet door? Where the inside panel meets the exterior trim piece? I doesn't look like it but I've read through several different blogs and only one that I read specifically said they chalked. We did one door with out and the paint gets in the most of the area but before we start all the other doors I wondered if I should chalk or not? This is are first attempt at painting cabinets and in the end I'm not sure if it makes a difference or not? Any thoughts? Your kitchen color. I'm looking for the perfect light taupe with a grey undertone. So my cabinets are really old and have wallpaper (ugly wallpaper) in the insets. Have you ever heard of just painting over the wallpaper if it is stuck on really well? great results. looks like you did it all right! Instead of vaseline on the drawers you could use Treewax. You could also use it on the front for an extra layer of protection.